FortisMail’s calendaring feature allows users to choose their default calendar view, show task start dates and due dates, specify working hours, and view the 7-day weather forecast. 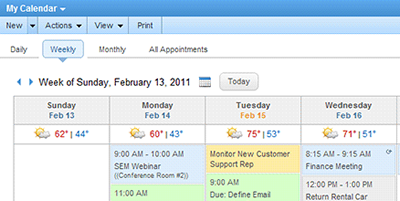 Plus, the free-busy scheduler and appointment invites with availability checking make it easy to find time to collaborate with business and personal contacts. Sharing resources across a company, department, or among a group of users is simple with FortisMail email collaboration server. Users can create, manage, and share collaboration items via webmail, third-party clients, or mobile devices. Recording and finding information on a contact in your address book has never been easier. Users can track entire conversations with a contact or view a list of recent appointments and attachments related to each contact with a click of a button. Plus, users can download, save or send contacts in .CSV or vCard format. 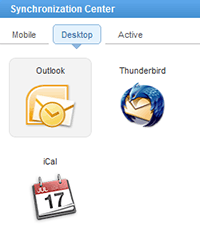 With support for a wide range of desktop clients and mobile devices, including Microsoft Outlook, Mozilla Thunderbird, Google Android, and iPhone, users can communicate efficiently regardless of the platform. Synchronization of email and collaboration items is accomplished through the Exchange ActiveSync add-on and the CalDAV, CardDAV, and SyncML protocols. 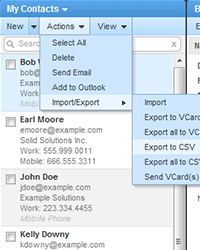 Plus, FortisMail uses two-way synchronization to seamlessly integrate with Microsoft Outlook. Businesses can use FortisMail’s mailing list feature to send mass email to customers regarding special promotions, product updates, or company news. Manage opt-in email lists and distribute email communications to large groups of people quickly and easily. Automatic detection and removal of bounced emails ensures greater efficiency in mailing list maintenance.